[179 Pages Report] The GMO testing market is estimated to be valued at USD 1.58 Billion in 2017. It is projected to grow at a CAGR of 8.2% from 2017 to 2022, to reach 2.34 Billion by 2022. The base year considered for the study is 2016, and the forecast years are from 2017 to 2022. GMO testing includes testing of crops and processed food for various traits such as stacked, herbicide tolerance, and insect resistance. The production of genetically modified crops is growing due to increase in nutritional demand, which in turn has led to the rise in stringency in genetically modified food safety regulations. This fueled the growth of the GMO testing market. The market players are responding to these new opportunities by expanding their global presence and product lines. The GMO testing market is segmented on the basis of trait, technology, crop & processed food tested, and region. This report includes estimations of market sizes for value (USD million). 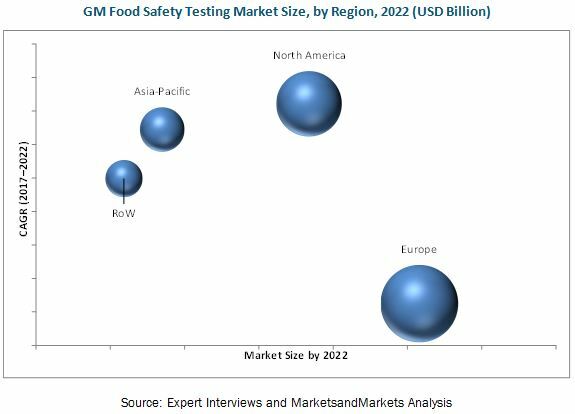 Both, top-down and bottom-up approaches have been used to estimate and validate the size of the global genetically modified food safety testing market and to estimate the size of various other dependent submarkets in the overall market. Key players in the market have been identified through secondary research, and their market share in respective regions has been determined through primary and secondary research. All percentage share, splits, and breakdowns have been determined using secondary sources and were verified through primary sources. The figure below shows the breakdown of profiles of industry experts who participated in the primary discussions. Key participants in the supply chain of genetically modified food safety testing are raw material suppliers, government bodies, distributors, and end users such as industries, consumers, and researchers. The major key players that are profiled in the report include Thermo Fisher Scientific, Inc. (U.S.), SGS S.A. (Switzerland), Bureau Veritas SA (France), Intertek Group Plc. (U.K.), Eurofins Scientific SE (Luxembourg), and TÜV SÜD AG (Germany). “The study answers several questions for stakeholders, primarily which market segenetically modified ents to focus on in next two to five years for prioritizing efforts and investments”. The market for GMO testing has grown exponentially in the last few years. The market size is projected to reach USD 2.34 Billion by 2022, at a CAGR of around 8.2% from 2017 to 2022. Both, developed and developing countries have been targeted for this industry as the consumer concerns toward GMOs have been revolutionizing the GMO testing technology. Need to ensure sufficient nutrition, evolution in farming technology, labeling mandates in several countries, diverse GM processed food production, and high investments in biotech R&D have been driving the market for GMO testing. The GMO testing market, on the basis of trait, is segmented into stacked, herbicide tolerance, and insect resistance. The stacked trait testing market accounted for the largest in 2016, and is projected to be the fastest-growing in GM testing for crops and foods due to the increase in R&D innovations and multiplicity of different traits in one crop or food. Also, the expenses and the procedure associated with the testing stacked trait are higher. The GMO testing market, on the basis of technology, is segmented into polymerase chain reaction (PCR) and immunoassay. The PCR segment accounted for the largest market in 2016, and is projected to grow at the highest CAGR from 2017 to 2022. The GMO testing market is segmented into crop and processed food tested, where the testing market for crops accounted for the largest. The crop segment is further subsegmented into corn, soy, rapeseed/canola, and potato, for which the testing for corn and soy accounted for the largest, and is projected to be the fastest-growing, as these are largely traded crops. The processed food tested segment includes bakery & confectionery, meat & meat products, breakfast cereals & snacks, food additives, and others, of which breakfast cereals & snacks is projected to be the fastest-growing market for GMO testing. Lack of proper implementation of regulations, lack of technical know-how among farmers, ban on the production of GM crops, and unaffordability of tests by food manufacturers & channel members are the major restraints and challenges in the GM food testing market for safety. One of the leading players, Intertek Group Plc (U.K.), adopted acquisitions as its key strategy; it also focuses on expansions to extend its capabilities in the GMO testing market. The company has been continuously improving its products and services through new and advanced technologies to create new opportunities in food industries. In 2016, Intertek acquired the Italian company Food International Trust (FIT-Italia), which provided a wide range of assurance, testing, and certification services. It was the first Italian company to receive ISI accreditation as an inspection body for the food sector and the first company in Italy to be accredited to deliver the International Food Standard (IFS) Food Store program. In March 2016, Eurofins Scientific invested in the expansion of its global infrastructure for advanced testing laboratories; it invested USD 800 million in 2016. Through these laboratories, the company would provide services such as food and microbiology testing. 2.4.3.4 Approved GM Varieties in the U.S. Figure 12 Approved GM Crops in the U.S.